Really Reasonable Ribbon Blog: Guest Designing with Really Reasonable Ribbon!! Hello everyone! This is Bev Gerard (a.k.a. TexasGrammy), and I am tickled pink to be here today as a Guest Designer for Really Reasonable Ribbon! If only you could see my smile! My heartfelt thanks go to True and Bonnie. My first project started out as an idea to give to a friend. Surely you've seen the office cubicles that divide up many office areas with shoulder-height padded walls. Many times the residents of such cubicles are permitted to add personal touches to their space. Thus, I've created a "cubicle hanging" ... or as shown in the full photo, a wall hanging. Oh so easy-peasy! I used Spellbinders Labels Nineteen to cut a chipboard shape, and also the same shape from some Heidi Grace designer paper and coordinating Prism cardstock as well. This awesome ribbon is from the "Shimmer Satins" assortment. Ohhhhhh this stuff is divine! These metal buttons have been hiding in my stash for a long time. 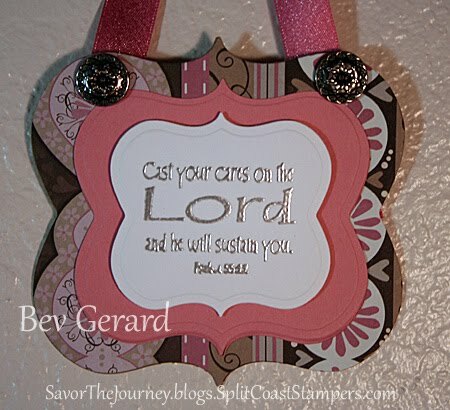 I love the way heat embossing adds a special beauty to sentiments, so the scripture is silver embossed. The fabulous "Shimmer Satin" assortment is also the source for the gorgeous green ruffled ribbon on my next project. I've had this idea on my mind for a while, and even though it took a little twist while I was working on it .... I think I just might have found my next birthday "stash" card. The scallops were cut with an MFT die-namics die. 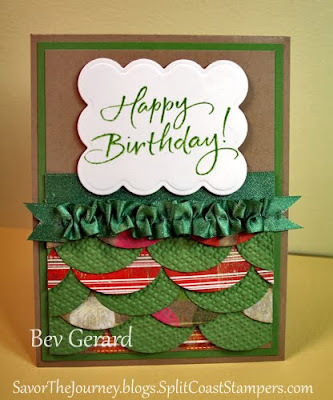 The cardstock scallops were also dry embossed with an SU embossing folder for a little texture. I hand stitched a line through the center of the luscious ribbon, pulled to gather it, tied a knot and it was so easy to lay a strip of adhesive in a line and place that ruffle right where I wanted it. It has been my sincere pleasure to have been asked to share some ideas with you here today! I hope you enjoy the projects! They're both lovely Bev, your papers and ribbon needed no more adornment. I love the cubicle wall hanging - sometimes embossing gets forgotten under all the other petting. WAUW I just love this wallhanging here. It´s so gorgeous and I agree, this ribbon is just perfect and ooh so lovely. You´ve done an outstanding job on both these projects, they´re gorgeous hun. Thanks sooo much for sharing your ideas with all of us here too. 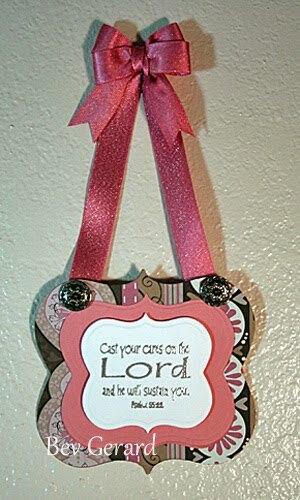 What a great wall hanging and card. Love the colors on both and that ribbon is fabulous. 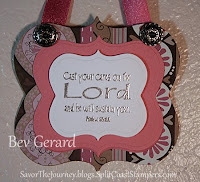 Isn't it great to use our stamps in different ways on different projects.....Thanks for sharing!!! Great projects Bev! Your photos really show the sparkle in the shimmer satin. Thanks so much for guest designing for us today at Really Reasonable Ribbon. Those are some beautiful projects. Thanks so much for sharing your beautiful work with us! Lovin' the 'cubicle hanging'. What a great idea! Thank you for sharing your talents with us! Your wall hanging and your card are fantastic!